Everyone loves Pirates, well apart from Queen Victoria of England of course, notoriously not that keen on the Skull and Cross Bones. There are few studios now pursuing traditional stop motion films, they are expensive and very time consuming to make, so we should treasure any that appear on the horizon. The simply titled “Pirate Captain” (Hugh Grant – voice) is the rather inept but much loved captain of a motley crew of oddball sailors. Assisted by his long suffering first mate, “Pirate with a Scarf” (Martin Freeman – Voice), clearly no budget being wasted on devising character names. The merry crew plunder the high seas in disorganized fashion, long voyages enlivened with their weekly highlight, “Ham Night”. For years the subject of ridicule by his bolder, braver and frankly cleverer contemporaries, Black Bellamy, Cutlass Liz and Peg Leg Hastings, the Pirate Captain has attempted to silence their criticism by winning the “Pirate of the Year – POTY” award. In previous years, success has been tantalizingly (read very much) out of reach but this year, it will be different. Quite how is not immediately apparent but he will win this year for sure, die trying or at least his crew will, due to his supreme incompetence. Those sea creatures on “olde worlde” sea charts, were just there for decoration, who knew? Fortunately, The Pirate Captain has a pet parrot that is recognized as a Dodo by Charles Darwin (Tennant – Voice), this allows interaction with Queen Victoria and provides a window of opportunity for POTY success. Whether this opportunity is taken through skill or only when every other avenue has been exhausted, is the story the screenplay attempts to tell. As you would expect, every Pirate cliché is mercilessly skewered with a very British humorous slant. The animation is excellent and colourful, mostly stop motion augmented with the occasional addition of CGI as and when required. Remember, everything has to be built. You want a miniature Pirate tavern, you have to build it yourself and whilst doing so, you might as well add an plentiful “in joke” bill posters on the outside. The movies score is suitably jaunty and pirate themed, Flight of the Conchords adding “I’m not crying, my eyes are sweating” for one poignant scene. Overall, this is rollicking good fun and does not outstay it’s welcome. 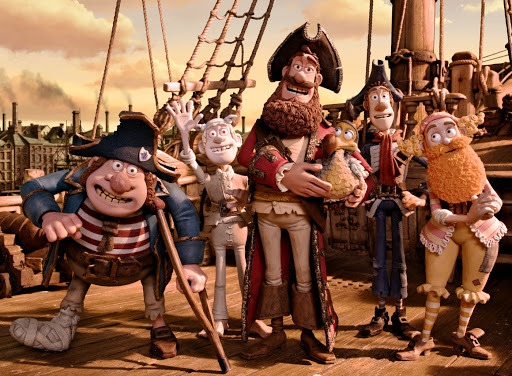 A splendid heavyweight voice cast, including Salma Hayek, Brendan Gleeson, Lenny Henry, Imelda Staunton, Jeremy Piven and of course Brian Blessed as the Pirate King, manage to bring the script to life. Despite being from the Aaardman studio, Wallace and Gromit are in no danger. The characterizations leaving the audience with less to care for and cheer on than usual but remains quality entertainment for the whole family. The animators capture of Martin Freeman’s mannerisms is almost unnerving, how this is achieved in stop motion, with only seconds worth of film produced each day, is astounding. The film is perhaps more English centric than a true world market blockbuster, which is why it only achieved moderate box office returns. Ultimately this is stop motion miniature Pirates with a great voice cast and suitably daft story, for the target audience this will be more than enough. Great Pirate fun, if swashbuckling is your game. Wannabe pirates young and old will find much to like here. Not a classic perhaps but with planks to walk, decks to swab and main braces to splice, this will have you talking like a Pirate in no time. Who could resist any movie with “Surprisingly Curvaceous Pirate” in the credits list, that beard fooling no-one but the Captain.